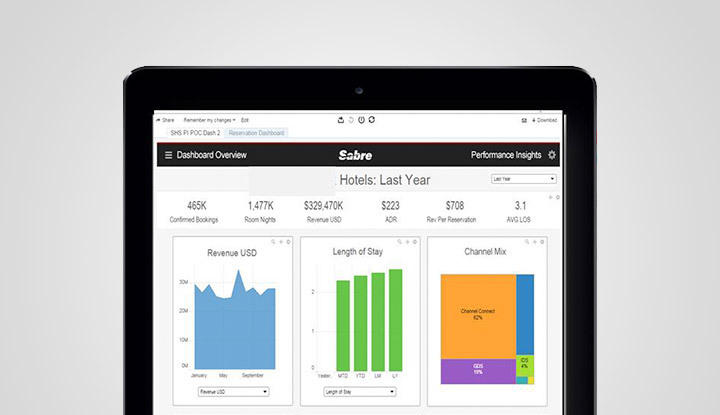 Performance Insights (PI) is a recently released business intelligence & analytics product that is a part of the Sabre SynXis hotel Computer Reservation System (SynXis CR). Serving more than 30,000 hotel properties around the world, SynXis CR is a comprehensive suite of best-in-class products that empower hotels and chains to better market and sell their products across multiple distribution channels, as well as manage the guest experience. PI unifies fragmented data from different systems (CR and other Property Management Systems) into a single data warehouse. PI provides a web-based analytical tool that users can use to explore, slice and dice their data using easy visualizations. Summarization of data across regions and brands is achieved with a few easy clicks. Users can visualize the data and export them to a variety of formats (Excel, JPG, etc.). Performance Insights helps hoteliers derive actionable insights from their data, devise strategies, and make better decisions in marketing their products to improve profitability and guest satisfaction.